It’s only fair that I advise you I am a Duke Blue Devils fan. Through and through. Black and royal blue is all I need to know. What might rival my hopes that Duke wins the ‘ship is that the University of North Carolina lose as early as possible. The rivalry fuels emphatically and my sense of TEAM levels at undeniable heights! A same feeling that I can relate to receiving a primo text from Nathan, the owner of Maritimes’ own Courtside Sneakers. The general idea of the text was whether TheBragAffair had any prior commitments with another shop, and then whether we wanted to team up again. Two texts that show how Courtside doesn’t look to get in the way of any other shop’s shine, and how they don’t perpetrate being more than a humble, hard working team, looking to better themselves and a community that they love. Back to how I don’t dig on anything Carolina blue… It is a problem. 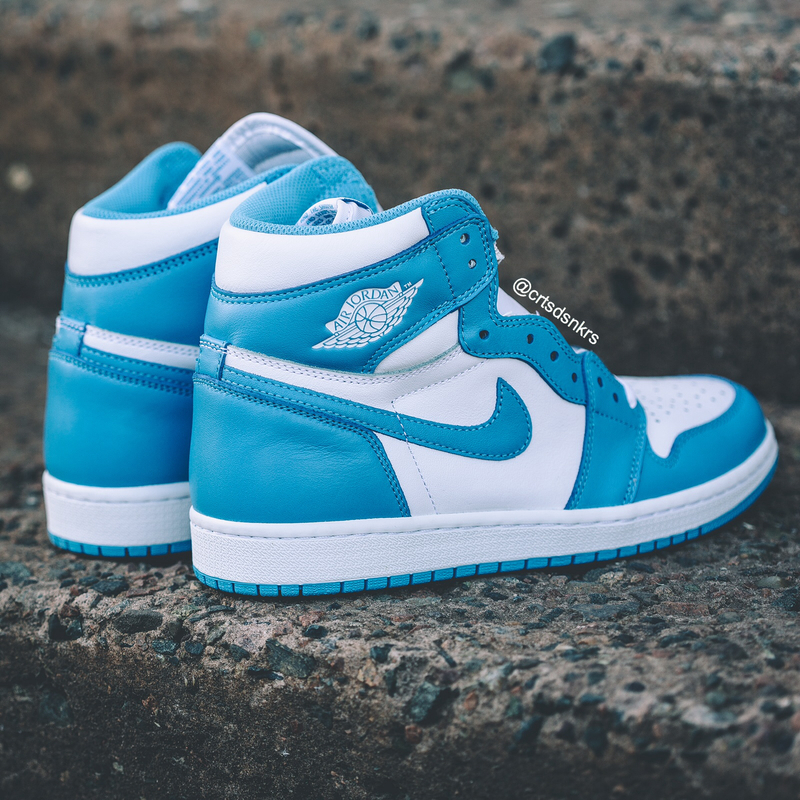 I had no interest in the Jordan 1 High UNC, but after Nathan showed me photos of Jordan Brand’s latest offering, conflict reigns high in my fanatical heart. Quality is on point. Smooth is the first word that comes to mind when I absorb the different angle shots sent over to me. This Jordan 1 is a problem. 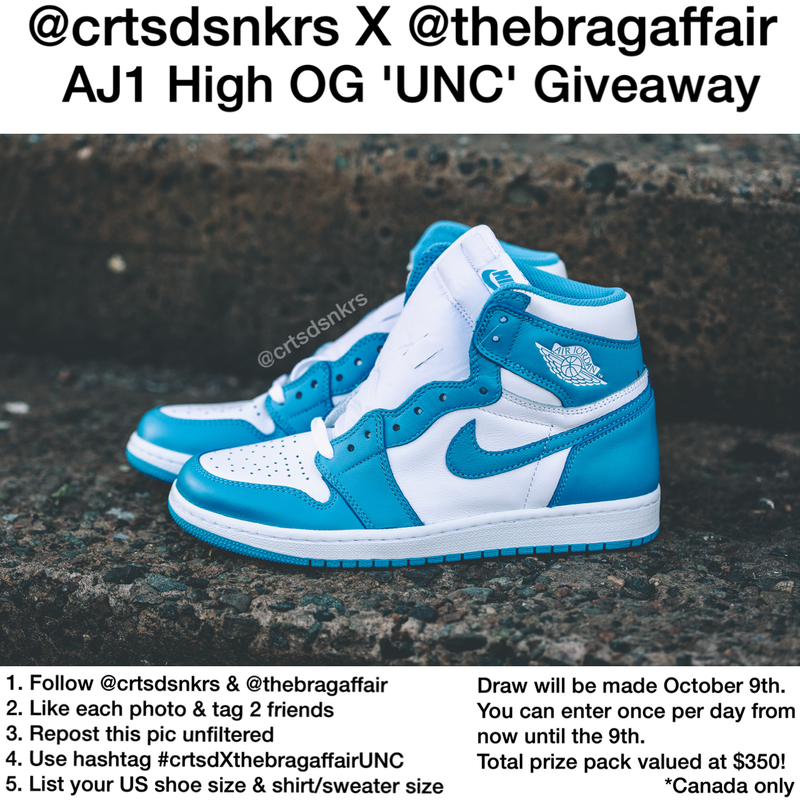 Fortunately for all our supporters, we are enthusiastically teaming up once again with Courtside Sneakers to giveaway one pair of Jordan 1 High UNC coupled with a Courtside Sneakers hoodie and tshirt, as well as a TheBragAffair tshirt for an awesome prize pack. 1. Follow both @crtsdsnkrs and @thebragaffair on Instagram. 5. List your U.S. shoe size & shirt/sweater size. Draw will be made October 9th. *This is a Canada Only contest. For all the lucky fans in the area, be sure to make your way over to the opening of Courtside Sneakers’ #Halifax location on November 14.